In "The Baron’s Governess Bride" Rupert Lord Steadwell is determined to hire the dowdiest, most unmarriageable woman he can find to care for his motherless daughters. The girls were heartbroken when their last governess eloped and Rupert does not want to risk a repetition. In her drab clothes, frumpy cap and spectacles, Grace Ellerby look like the ideal person for the job. 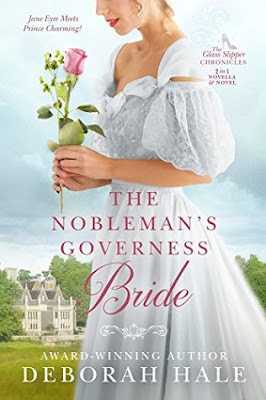 Previously published as "Much Ado About Nuptials" and The Baron’s Governess Bride. I enjoyed these two stories! I love the Regency setting, and the characters and plots kept me interested and looking forward to how the happy ending would play out. The first story was shorter, but the personalities of Sebastian and Rebecca were both strong and vibrant. Even though she disagreed with his motives, Rebecca looked below the surface and began to understand Sebastian in a way nobody else did. Her compassion for him while also holding firm to her own opinions repeatedly took him off guard and an unlikely friendship developed, which of course blossoms into love. It was fun to read their sparring and banter, and see them bring out unseen sides in each other.